Page revised in April 2015. Religions try to meet some basic expectations felt by mankind: the desire to know about the origin of the world, the need for ethical values, the hope for some sort of immortality, the wish to influence events. Greeks and Romans alike did not bother very much about cosmogony and afterlife; their gods did not behave particularly well; the focus of the Greek/Roman religion was on trying to influence events by knowing in advance whether a certain action would succeed or fail. Another aspect of their beliefs was a long list of actions/things which brought bad luck and thus should be avoided. This explains why there were so many oracles (from Latin orare to speak) in the Ancient World. From the Temple to Apollo in Miletus a Holy Road reached a gigantic shrine dedicated to the same god and located some twenty miles south of the town. The final section of the road can be seen just before reaching the archaeological area. The road was paved by Emperor Trajan. A large temple was built in the VIth century BC, but it was destroyed by the Persians to punish the inhabitants of Miletus for their rebellion. Alexander the Great promoted its reconstruction and the new temple was designed to be one of the largest of the Greek World. Because of its size archaeologists speak of a Greek Karnak with reference to that gigantic Egyptian place of worship. The construction of the temple lasted for centuries and actually its decoration was never entirely completed. The site is called Didyma, which in Greek means twin; recent excavations along the last section of the Holy Road have identified evidence of a (smaller) temple dedicated to Artemis, the twin sister of Apollo. Columns of the porch and passage leading to the "adyton"
In the porch the faithful met with the priests in charge of referring their queries to the sibyl; the priests then disappeared into two long corridors which led to the adyton, a space where the general public could not enter (adyton = do not enter). Similar to Delphi the adyton was located at a lower level, but unlike Delphi, at Didyma the cell containing the statue of the god was placed in a large courtyard. Water played a major role at Didyma. The faithful did their ablutions (ceremonial acts of washing parts of the body) at a well at the foot of the temple, while the sibyl made use of another well in the adyton. The adyton had an elaborate decoration mainly based on griffins, mythical creatures with the head and the wings of an eagle and the body of a lion. They were sacred to Apollo and were in charge of guarding his gold in Scythia (southern Russia). The three standing columns are not the result of a modern reconstruction: they have been standing for more than 2,000 years. In the region, columns of similar size can only be seen at the temple of Annia Faustina at Sardis. The outer decoration of the temple is mainly based on heads of Gorgons. 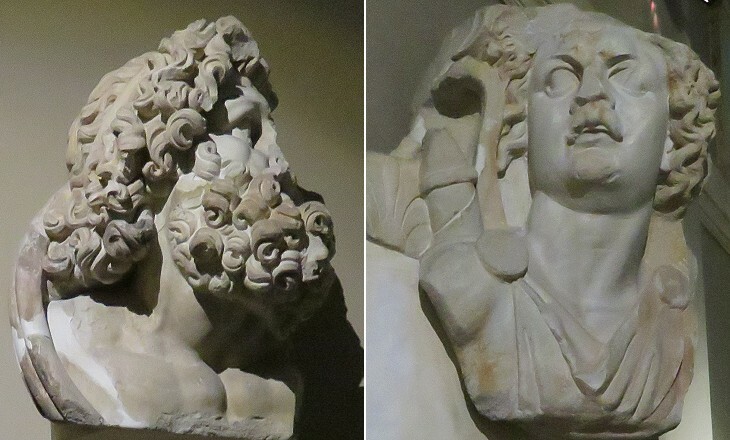 In the Greek myth Gorgons were three sisters (Medusa, Stheno and Euryale) with snakes for hair; they had the power to turn anyone who looked at them to stone. Medusa was beheaded by Perseus. Gorgons were also regarded as patrons of secrecy and the whole process of querying the sibyl and reporting/interpreting her utterances was to be kept secret. 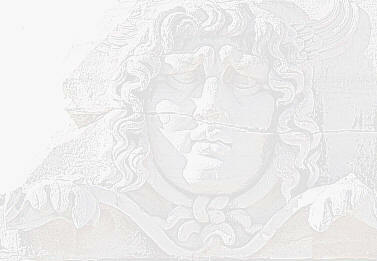 In addition a Gorgon's face (Gorgoneion) was regarded as a charm against ills. Emperor Justinian in his efforts to eradicate the ancient beliefs turned the god's cell into a church; subsequently the oracle was abandoned. Near the archaeological area there is a large mosque: a relief shows that at one point it was a church (one can see a partially erased cross and the inscription is written in Greek).